We've all heard the cliche about "thinking outside the box." We've all tried to put it into practice. At some point or other I'm sure we've all thought we were thinking outside the box (when really we were just rehashing completely inside the box ideas) and I'm certain that at many points we've all given up thinking outside the box. What is there that hasn't been tried, after all? 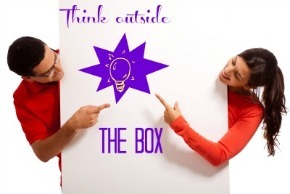 Being outside the box is often compared to being outside your comfort zone or being really outrageous in your thinking. BUT it could also mean something as simple as adding an element of surprise to your process. Any aspect of change can be outside your box. Anytime you do something unexpected, it will be noted. The every day routine of your business gets taken for granted by you, your staff and your customers. But if something happens that your customer was unprepared for, it will stick in their mind. There are quite a few home improvement stores in my city, as I'm sure there are in yours as well. There is only one, however, that has a popcorn machine with fresh, help yourself popcorn ready for me every time I walk through the door. Guess which one I go out of my way to visit? I have a dog. There are a lot of pet supply stores in my city as well. My go-to store is conveniently only one block away from my house. Believe it or not, they are also a movie rental store. That's right. Movie rentals. Movie rentals and pet supplies. That's outside the box alright, and they are always busy! There is a local neighborhood pub that my friends and I visit on occasion. They used to be incredibly slow Monday nights. They always have a $5 Appy Hour menu that typically runs from 3 - 5 PM every day of the week. Now, it runs all night long on Mondays and they are always busy on Mondays! None of these ideas are particularly shocking, but they are all a little bit outside the box and, although I am not privy to the inner workings of any of those businesses, they all seem to be working. As you know, our products reduce evaporation. By reducing evaporation, humidity is greatly reduced indoors. A few years ago I had a customer call me to talk about one of the systems he had installed for his showroom. He was adding Heatsavr manually to the majority of his spas, but he had also installed one of our Heatsavr Kits on a Swim Spa to show off the system while also benefiting from the reduced indoor humidity. Now, whenever I hear of retailers who have indoor showrooms, I suggest using the product to make their location more comfortable and as a sales tool! I was talking to a service company a while back and they were struggling to find a way to successfully sell our Ecosavr fish to their customers. We brainstormed some ideas and a few weeks later he came back to me with a plan: he was going to add a new component to his route that would be a heat retention add-on package. For an additional fee each month he would help reduce heat loss from any swimming pool, while also conserving water. Essentially, instead of selling a product, he was selling a service. And it worked! A few years ago a new builder starting selling a lot of our Heatsavr Kits. It was quite exciting and, when given the opportunity to talk to the company, I asked about their techniques. Apparently, the sales guys were in a friendly competition (for nothing but bragging rights!) to see who could install the most systems throughout the season. They really didn't like selling traditional pool blankets, so it was a fairly simple transition for them, and - aside from boosting our business - they were also gaining continuous, life long customers who would come back to them year after year to refill their Heatsavr supply each season. Again, these are simple tactics, but just a bit out of the ordinary. As you get ready for opening season, if there is any way that I can help you think outside the box and grow your business, I hope you will always feel welcome to get in touch with me. I always look forward to hearing from you!